The seasons have been varied this year. Fall had some frigid days. Winter had some warm days. And now, in the early days of Spring, we have summer-like temperatures. Today was 82 degrees! I wonder if it is confusing to the plants and trees that bloom at certain times. 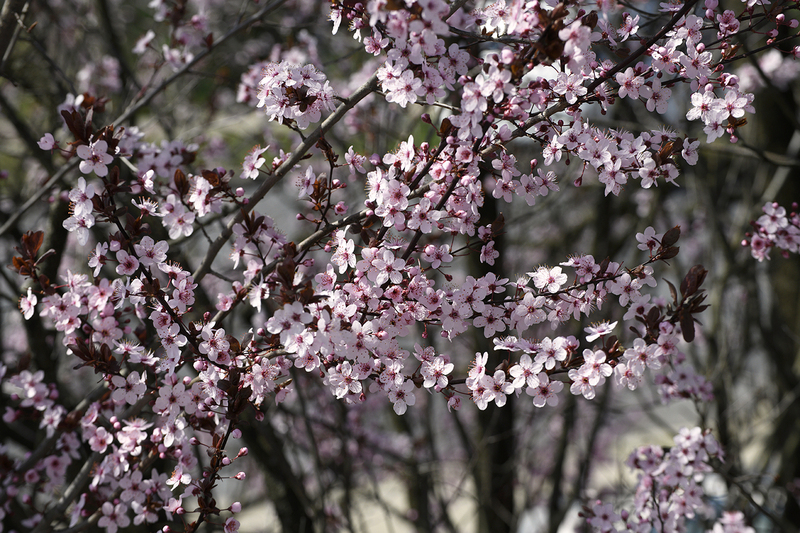 This flowering plum tree in our front yard seems to be taking it all in stride. It flowers in early-middle Spring, in pretty much any kind of soil. For me, it is a sign of awakening regardless of what the weather does. I stop along my afternoon walk to calmly watch the delicate petals float down from the branches as the season progresses. So much is happening in the world today that a simple gift of nature like this is much appreciated. The delicate pink flowers remind me of how life flutters on, how it shifts from beautiful to decimated and hopefully back again to a space that offers us a chance to take a deep breath, to experience joy and to share our awareness of life's flowering with those around us. When Van Gogh arrived in Arles in February 1888, the area's fruit trees in the orchards were about to bloom. The blossoms of the apricot, peach and plum trees motivated him,and within a month he had created fourteen paintings of blossoming fruit trees. Excited by the subject matter, he completed nearly one painting a day.Around April 21 Van Gogh wrote to his brother Theo, that he "will have to seek something new, now the orchards have almost finished blossoming." Flowering trees represented a source of spiritual renewal for Van Gogh; in 1883 he had written of the symbolism of the flowering tree, seeing the evidence of rebirth like the "man who finally produces something poignant as the blossom of a hard, difficult life, is a wonder, like the black hawthorn, or better still the gnarled old apple tree which at certain moments bears blossoms which are among the most delicate and virginal things under the sun." In 1888 Van Gogh became inspired in southern France and began the most productive period of his painting career. He sought the brilliance and light of the sun which would obscure the detail, simplifying the subjects. It also would make the lines of composition clearer; which would suit his ambition to create the simple patterns that he appreciated in Japanese woodblocks. Arles, he said, was "the Japan of the South." Van Gogh found in the south that colors were more vivid. Pairs of complementary colors, such as "the red and green of the plants, the woven highlights of oranges and blue in the fence, even the pink clouds that enliven the turquoise sky" — create an intensity through their pairing. "In his flowering trees, Vincent attained a sense of spontaneity, freeing himself from the strict self-analytical approach he took in Paris. In Almond Tree in Blossom,Vincent used the light, broken strokes of impressionism and the dabs of colour of divisionism for a sparkling surface effect. The distinctive contours of the tree and its position in the foreground recall the formal qualities of Japanese prints." The southern region and the flowering trees seem to have awakened Van Gogh from his doldrums into a state of clear direction, hyper-activity and good cheer. He wrote, "I am up to my ears in work for the trees are in blossom and I want to paint a Provençal orchard of astonishing gaiety." While in the past a very active period would have drained him, this time he was invigorated. Senators Feinstein and Collins Introduce The Personal Care Products Safety Act to Protect "consumer health and strengthen the [FDA's] efforts to regulate ingredients"